One of the most important factors that works in favor of Digital Marketing is Cost Effectiveness. 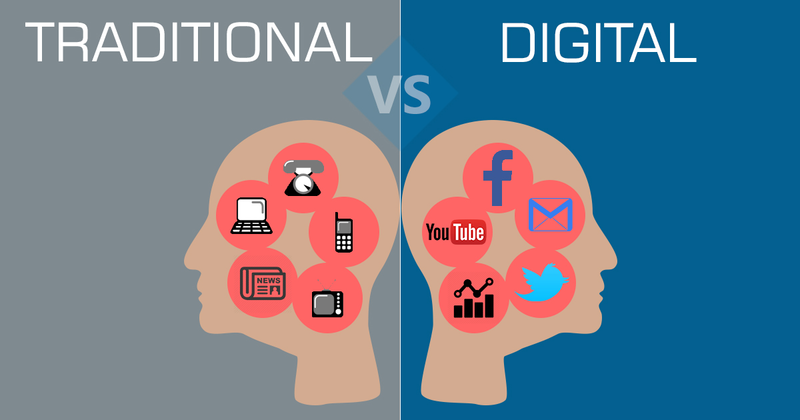 Digital marketing is very economical as compared to traditional marketing. You can reach to thousands of people spending just a few dollars on Facebook ads whereas if you want the same results from traditional marketing then be ready to shell out a few thousands atleast. When you are marketing through hoardings and TV commercials, it is not necessary that your target audience will see it, it might reach many people but it is not necessary that they are your target group whereas in digital marketing you can be very specific while selecting the target audience. If you launch a new sport shoes for men then through Google ads or Social Media ads you can actually target males with a specific age who are into sports. This same thing is not available in traditional marketing. Can you measure the number of people who went through your hoarding or the number of people who heard your ad on radio? No, but if you are promoting your product on social media then you can see how many times your ad was seen, how many people clicked on your ad, which pages did the user visit after coming on your website and many other insights can be obtained. In traditional marketing, when you launch a campaign like making a new TV commercial then you cannot expect the results immediately, it may take a few months before you come to know that whether your campaign was a success or no but with digital marketing you can get real time results. When you launch a new campaign like a Facebook or Twitter contest, you can immediately know whether people are following it through comments, likes, retweets etc. So even if the campaign is not working well, you will come to know immediately and therefore you change the campaign to something more interesting. When you put up a hoarding then only the people living in that vicinity and passing through that area can see it, similarly even if you are putting an ad in newspaper then only the people who read that newspaper might see it, the exposure is quite limited. That is not the case in digital marketing; with just a click you can reach to international audiences as well. The exposure that your campaigns gain when marketed digitally is much higher than the traditional marketing. How often do you think people will pass on your flyer to someone else even if they liked it a lot? It is a very rare occurrence but with digital media the chances of people sharing a particular picture or video which they liked is quite high. Just one click from one person and your campaign is seen by hundreds of more people so the chances of going viral online are very high as compared to traditional marketing. But one has to be careful as bad news travels faster so make sure you have an efficient ORM team in place. With the digital marketing industry growing everyday the demand for efficient Digital Marketers is also growing. With over 1,50,000 digital jobs being predicted by 2020, making a career in digital marketing is a the best choice for any marketing professional. As mentioned above the investment in traditional marketing is decreasing and therefore you can also expect a downfall in the opportunities for traditional marketing. Digital Marketing has its share of disadvantages as well like you cannot reach to people who are anti – social or who are not present online and one mistake can tarnish your image if it goes viral but if you go to see, the number of pros are higher than cons so wait no more and start planning your digital marketing strategies today that is if you have not started them already.